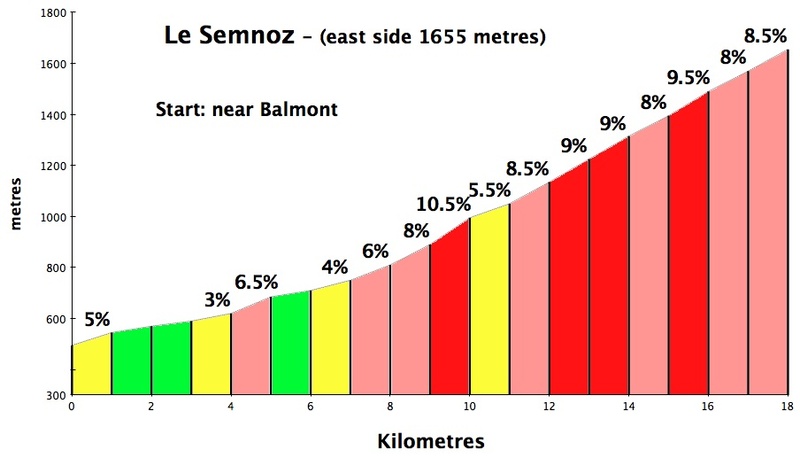 I cycled up Le Semnoz the other day and thought I’d put together a comprehensive post about this great mountain that is not too well known by cyclotourists. Le Semnoz is the mountain on the west side of Lake Annecy. 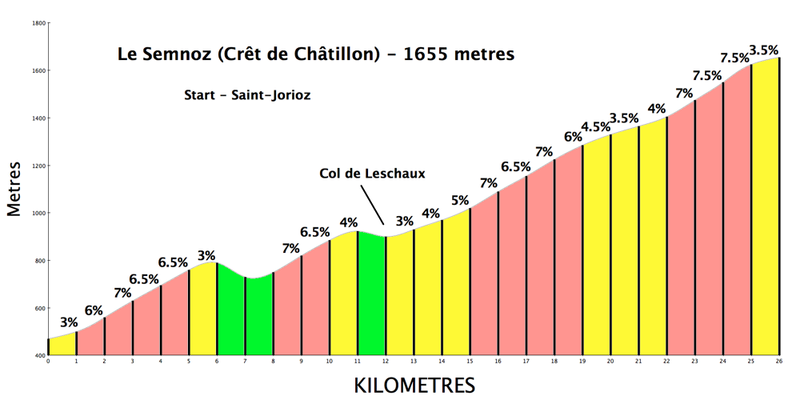 Unlike the bigger mountains on the east side of the lake, it’s possibly to cycle up to the peak: Crêt de Chatillon. 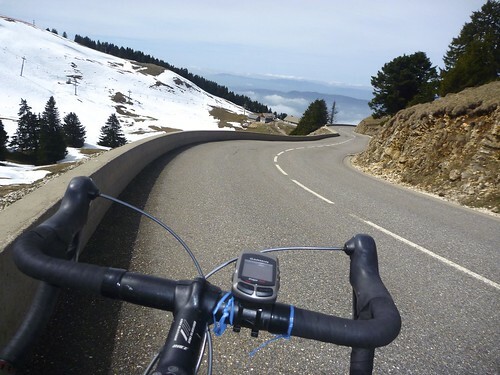 There are several interesting choices to cycle this beautiful mountain. It’s easy enough to construct a fabulous loop by going up one side and down another. In addition to the 5 road bike options detailed below, click here for a mountain bike option. The first 2 routes are similar and the shortest, thus the steepest. Primarily through the woods, apart from a flattish stretch in the middle, this is hard work. This route is kept open in winter almost to the summit to serve the small ski station at the top. Ride details here. I ran into a traffic jam of goats here once (video). This route starts on a very quiet forested road from the west and then joins the north route roughly half way up. A very good alternative to the north side. Ride details here. 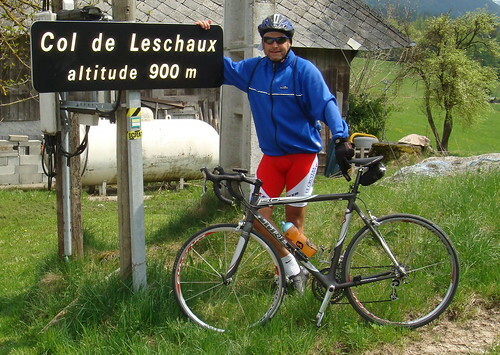 I once described the climb from Annecy to Col de Leschaux as a perfect introductory climb for someone new to cycling in the mountains. 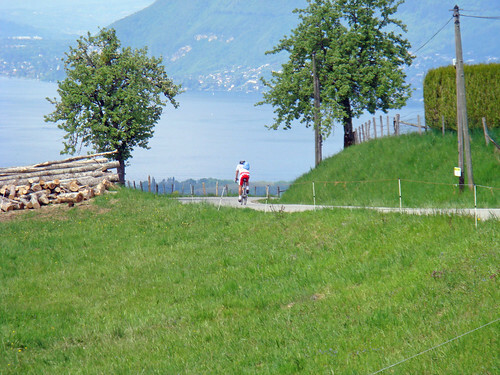 Twelve kms long and not steep at all – and plenty of views of Lake Annecy. 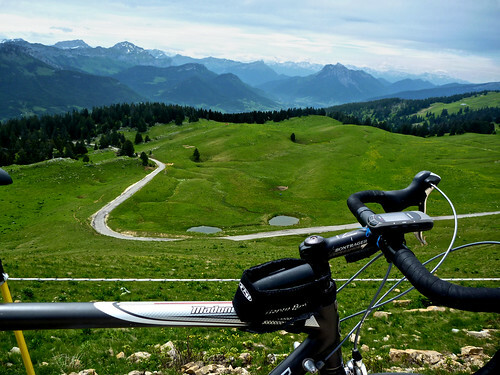 From Col des Leschaux is a beautiful and quiet back way up to the top of Le Semnoz. 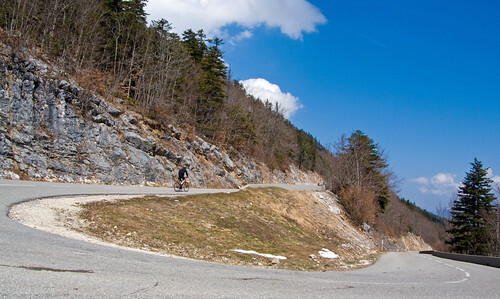 Just above the col are superb hairpins that lead ever higher with great views. This route is sometimes but not alway closed in winter. Ride details here. Coming from the south, this route could be extended all the way to Aix-les-Bains or combined with a loop of Mont Revard. 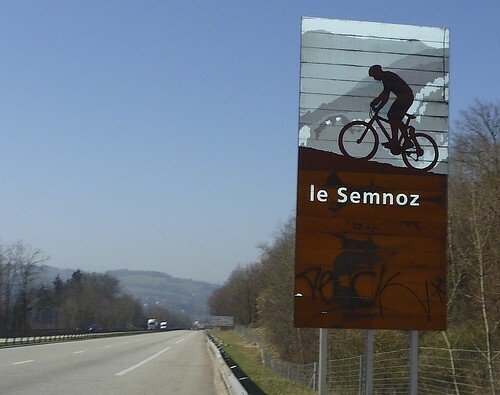 This link shows a way around Le Semnoz from the south to make an excellent loop in either direction. This is perhaps my favourite way. 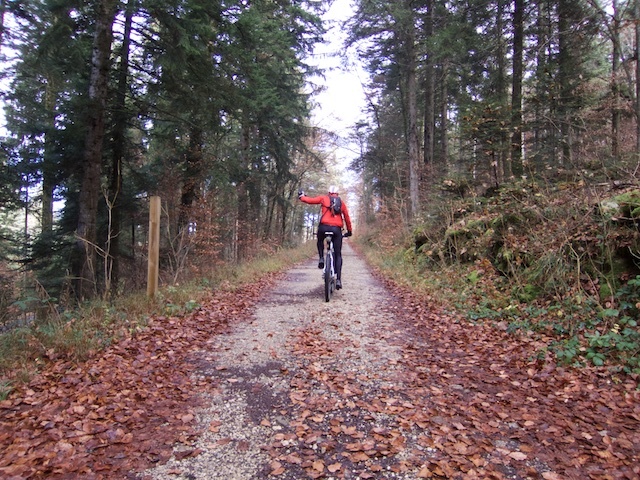 I take the Annecy bike path to Saint-Jorioz and then follow a very quiet road up to Saint-Eustache on the way to Col de Leschaux, qnd then up to Le Semnoz. 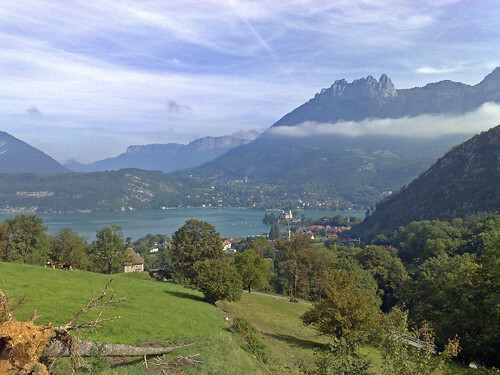 This route gives the best views of Lake Annecy on the early slopes. Ride details here. There is an old road that starts part way up the north side. Closed to cars, it’s lots of fun. Ride details here. 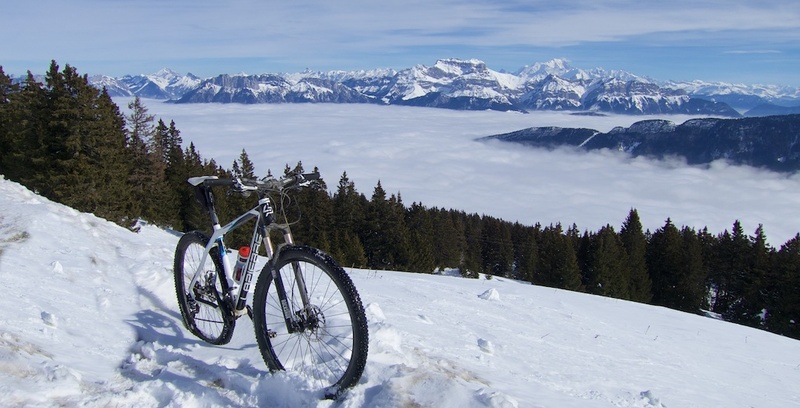 Feb 2015, on a nice sunny day, I cycled up to the ski station at the summit of Le Semnoz on a mountain bike, and then rented cross-country skis and skate-skied the trails at the summmit, before descending the far side. Woohoo. Details here. Chill, what’s up with those shorts in #3? Very colorful……..
lol hey man you need to put up a NSFW warning for #3! Next time you’re in Leschaux, check out the Auberge run by Vincent and Cathy….. superb and good friends.. they will look after you Will..
New to the area and delighted to have found your very helpful site. Slowly making my way through each of your rides every weekend. Bonne route! Thanks for sharing this information. I recently went to Annecy and we took your advice and did route #1, the direct north route. Was pretty tough. The first time we did it their was snow at the top and it was snowing – we didn’t go equipped for those conditions so we had to descend slower than we went up! The 2nd time we rode up it the weather was much better and the views were great from the top, followed by a super fast descent. Looking forward to seeing how quickly they do it in The Tour this year. Great post! 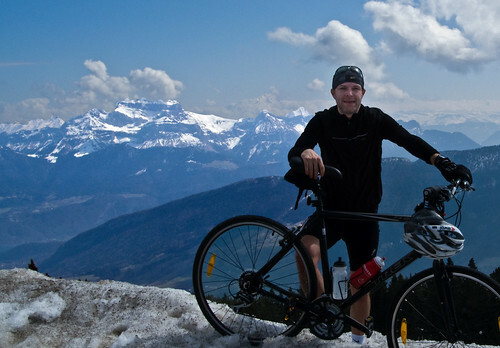 Off the back of zero cycling in the past 3 years, having spent July 2013 doing 3 x 45 mins spinning classes a week, and weighing 14 stone, I set myself the challenge of climbing Semnoz (the red route) on a recent family holiday to annecy. I accomplished my goal the first full day there, and climbed Semnoz two other times as well… All three times ascending the red route, and descending on the eastern side, through Leschaux and St Jaurioz, then back to Annecy. Absolutely magical rides. they are super challenging but doable. Great restaurant at the summit. 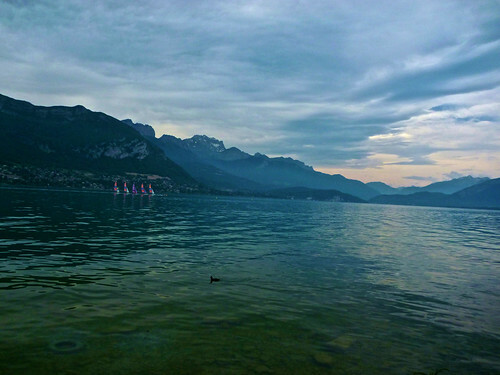 Annecy is beautiful for anyone who has family – great shopping centre, the lake has loads of amenities (water sports centre which rents canoes and dinghies – we rented a hoboe cat twice), kids fun centre, pedal boating, lake swimming and beaches. Brilliant holiday and great ride – would strongly recommend. Great info on the the Semnoz options. Fortunately I found this post prior to arriving in Annecy and I opted for route 5. I come from flat Perth, Western Australia and your suggestions made my first serious climb vey enjoyable. 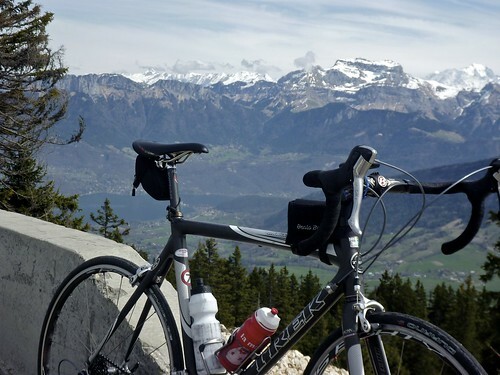 Met with a Dutch rider at the summit of Le Semnoz and he suggested route 1 back to Annecy. It was quiet and I got a taste of a nice long descent. The descent left me 300m away from my Hotel. Perfect! Can you provide me with the GPX files ? I’ve updated the post with strava maps that if you click on will lead you to a page that has a gpx link at the top of the map. Or go to the detailed post mentioned in each ride and there should be a link if you click on the map in the specific post. Thanks for this, Will. I will hopefully get the chance to put together a loop, probably #3 up and #1 backwards back down to Annecy the last Friday of July, before guiding for eight days, ending up in Bedoin.